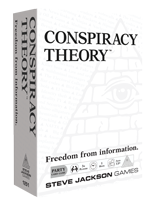 Steve's latest card game, Conspiracy Theory, has shipped to the U.S. Kickstarter-project backers and, best of all, is now available to preorder on Warehouse 23! The first printing of the game is not being released through our traditional distribution channels, so you'll have to either order direct from us or find the game at one of the friendly local game stores that supported the project and is offering the game at retail. We did not produce thousands of extra copies of this first printing of Conspiracy Theory, so please check out the official webpage and then preorder today. Warehouse 23 preorders will ship late this month, after we have fulfilled the international Kickstarter rewards.